Artists’ Television Access and SFPL present director Curtis Choy’s moving documentary The Fall of the I-Hotel. 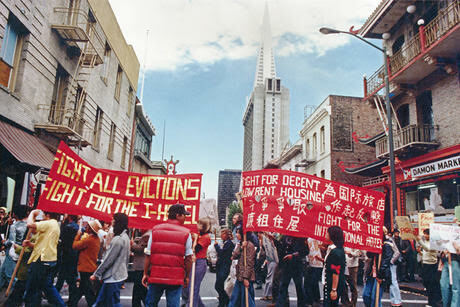 In August 1977 thousands of people took a stand against eviction that has reverberated in San Francisco ever since. The Fall of the I-Hotel documents the culmination of a decade-long battle to save the International Hotel, whose residents, mostly Filipino and Chinese seniors, struggled to save their homes. SFPL’s screening of an original 16mm print of this film commemorates the fortieth anniversary of a key moment in San Francisco tenant activism. The Fall of the I-Hotel will be preceded by two short films, Alan Ohashi’s Chinatown: Portrait of a Working Community and Arthur Dong’s Sewing Woman. Sponsored by the Filipino American Center.